Penny Loafers – a must have in every man's closet. There are numerous thoughts about how penny loafers got their name from. Basically, it is classified as a casual leather shoe with a slotted strip over the upper, where men used to place a coin. 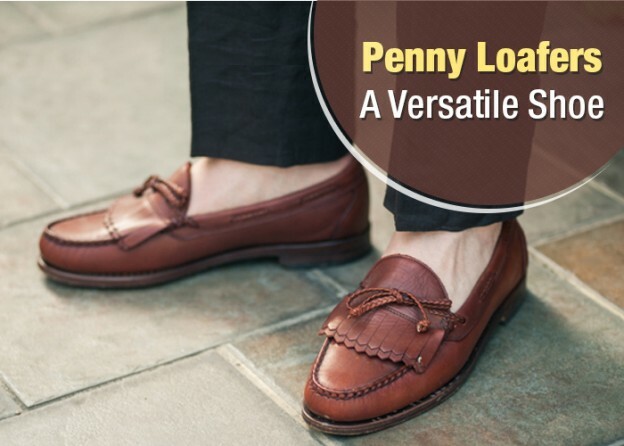 The best part about penny loafers is they are very practical. You can easily slip them on and off without any difficulty. However, loafers are mostly worn in summers but you can even style them in winters wearing with your ankle socks. Style them at your lunch or for your dinner evening. Black Penny Loafers: Black is the timeless color and can be worn with almost any outfit. Style them with chinos, a jumper and with the hat just for an addition. Brown Penny Loafers: Basically, the original loafer color which is perfect for your casual look; style either with your baggy jeans or with shorts. You can also wear a blazer with a crisp white shirt. Burgundy Penny Loafers: Pair your burgundy loafers with a blue/navy shirt for a smart casual look. Suede Penny Loafers: Perfect for your summers but if you are thinking to wear them in winters then make sure you apply suede protection. Your suede penny loafers will look best with chinos or skinny jeans. Loafers and Chinos: Chinos are perfect for your summers and with brown loafers they look amazing. For more attractive look roll them up till ankle. You can also add a jacket for a smarter look. Loafers and Jeans: If you are a die-hard fan of wearing casuals then look no further and team your penny loafers with jeans. Whether you are heading for a night out or going with your friends for a pint of beer. This combination never lets you down. Loafers and Shorts: Definitely YES! Team with a white T-shirt, navy shorts and obviously your loafers. You are set for chilling out with your friends. Loafers and Suit: Combination of suit and color must be perfect else it will turn you a fashion disaster. If you are thinking to wear a black suit then go for black footwear only, avoid wearing brown color. Make sure you keep the bottom of your trousers a little up just to showcase your loafers. Whether you are attending any formal event or function, chilling out with your friends, or just a casual beach day; loafers never lets your outfit suffer. Style them confidently.